Love love gladiator sandals in the summer. Can’t wait to stock up some pairs for next summer that are currently on sale. Enjoy ur vacation:-). Oh so cool comfy chic look. What a fun top! I love how you paired it with gladiator sandals. Adorable!! Gorgeous sheer trench vest, what a fun outfit! Sorry you miss the pup. 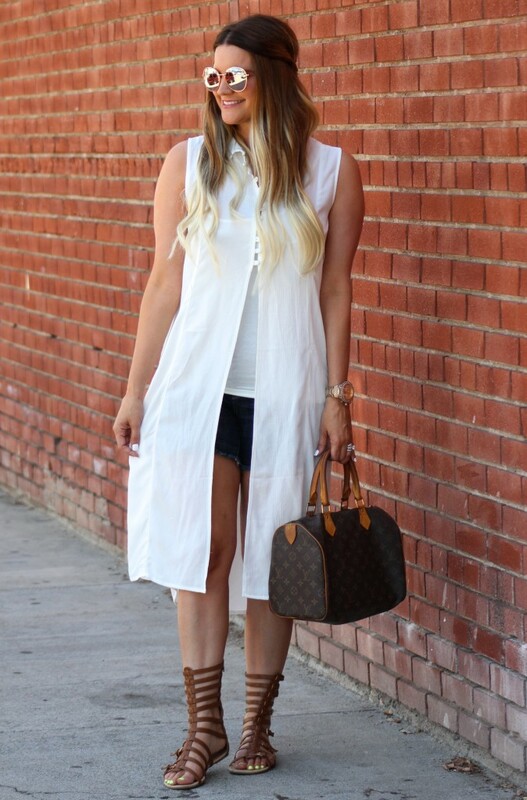 Loving your long white vest! It’s a cool element to the outfit. Obsessed with this look! You look stunning! So fun + breezy- perfect weekend look, lady! Loving this look. Wish I could pull off the gladiator look, but I’m loving that white top! The entire look is fantastic! I love the gladiators and the long white top! Have a great day! I am so obsessed with your sandals! I have been wanting a pair of gladiator sandals for ages. These look so cute on you! Have a great weekend and keep enjoying your vacation! I really love that long top! Those sandals are amazing too! This top is incredibly cute! Loving this look!! Those sandals are everything!! I’m obsessed with them! And they’re a perfect color for fall!! LOVE! I love your top, so chic! That top is so rad! Sigh. Sometimes I really wish I had the guts to pull off something this fabulous. THIS is how you make a fashion statement. Looking good, babe! Love this so very much! You look amazing! Perfect weekend look! Your top and sandals are amazing!! I love this look! This outfit is so chic and perfect for every summer day! LOVE those sandals girl! Adorable with a Capitol A! I am so loving those gladiator sandals on you you wear them so well! I hope your weekend is fun and relaxing beautiful lady! Hello gorgeous love the outfit, the top is gorgeous a definite steal i love the design. you look great as always. Love those sandals – I was really wishing I’d gotten a pair this summer! Love this bohemian style look! Also, great gladiators!